What is the metadata server? What metadata server operations are supported? What clients can I use with Cumulus? How are Nimbus and Cumulus related? Can Cumulus be installed without Nimbus? Can Nimbus be installed without Cumulus? Does the Nimbus IaaS system directly use Cumulus for image propagation? What type of storage system backs the Cumulus repository? Options aren't always a good thing, especially to start with. 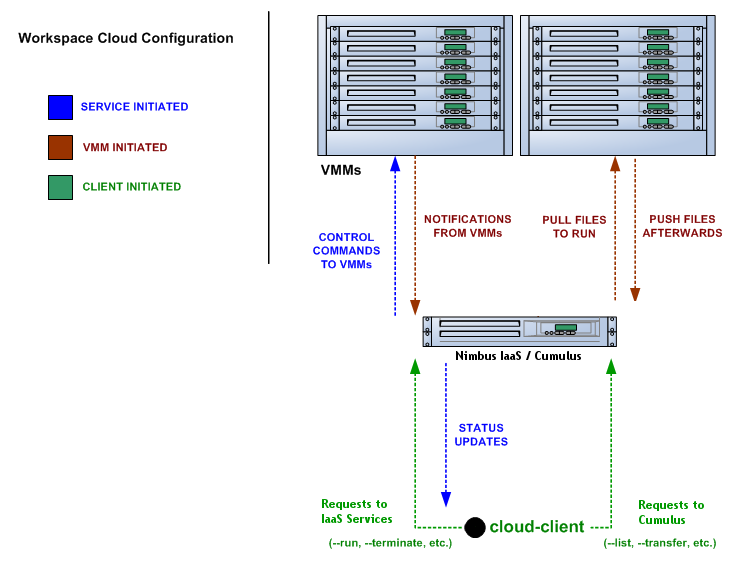 The main way to deploy Nimbus is the cloud configuration. This involves hosting a site manager service and creating an image repository (see the Zero To Cloud guide for details). You direct your new users to use the cloud client which gets them up and running in just a few minutes. Nimbus itself is not hard to install, it has a script driven install that asks you two questions. Nimbus requires that some dependencies are installed first. On the service node: Java, Python, and bash. On the hypervisor nodes: Python, bash, ebtables, libvirt and KVM or Xen. See the Zero To Cloud guide for details including detailed prerequisite information. Cumulus is an open source implementation of the Amazon S3 REST API. It is used as the Nimbus repository solution and can also be installed standalone. Writing new components should be a matter of "dropping" them in. As explained in "What is the RM API? ", the Java side of things is particularly LEGO® like. As of Nimbus 2.3 workspace-control (the VMM component) is modularized with around 10 plugin points. And we are working towards modularizing even more and providing better implementations for various components. Any questions, suggestions, and requirements in this area are appreciated. This is the protocol implementation in longstanding use by previous workspace services and clients including the popular cloud-client. This is an implementation of two of the Amazon Elastic Compute Cloud (EC2) interfaces that allow you to use clients developed for the real EC2 system against Nimbus based clouds. There is support for both EC2 interfaces: SOAP and Query. The URL for this is obtained by looking at '/var/nimbus-metadata-server-url' on the VM, which is an optional customization task injected by the Nimbus service on your behalf (we are considering trying to simulate Amazon's hardcoded IP address "169.254.169.254" on any subnet, feedback on this idea is appreciated). Like on EC2, its responses are based on the source IP address from the TCP packet, giving the information specific to each VM instance. This also means there is an assumption that the immediately local network is non-spoofable. Administrators, you should also put in place a firewall rule that restricts this port to the VMs only, just in case. The metadata server is disabled by default, consult your administrator (or try a query from inside your VM). Administrators, see "services/etc/nimbus/workspace-service/metadata.conf" for the details. meta-data/ami-id - the ami-id assigned to this image. This is simulated by the EC2 protocols in Nimbus, the "definitive" piece of information for a launch is really the filename in the repository, there is not AMI registry like on EC2. meta-data/ami-launch-index - if this VM instance was launched as part of a group (cluster), it might have a launch index other than zero. This differentiates it from other homogenous nodes in the launch. - What 'public' and 'private' mean in this context is up to an administrator configuration. The VM also may or may not have two NICs on it, the values of these fields might be equal or not. Currently, the workspace control tools work with Xen and KVM. Implemented in Python in order to be portable and easy to install. Requires libvirt, sudo, ebtables, and a DHCP server library. This is a user-oriented system that runs as an "overlay" on top of the normal VM-on-demand mechanics. It's been used on top of Nimbus clouds as well as with EC2 resources. Nimbus Web is the evolving web interface for Nimbus. Its aim is to provide administrative and user functions in a friendly interface. Nimbus Web is centered around a Python Django web application that is intended to be deployable completely separate from the Nimbus service. Instructions for configuring and starting the application are in this section of the administrator guide. Cumulus is an open source implementation of the S3 REST API. Some features such as versioning and COPY are not yet implemented, but some additional features are added, such as file system usage quotas. Cumulus is compliant with the S3 REST network API, therefore clients that work against the S3 REST API should work with Cumulus. Some of the more popular ones are boto and s3cmd. The Nimbus cloud client uses the Jets3t library to interact with Cumulus. Cumulus is the front end to the Nimbus VM image repository. In order to boot an image on a given Nimbus cloud, that image must first be put into that same clouds Cumulus repository (advanced use cases can by pass this). Yes. Cumulus does not rely on any higher level Nimbus libraries and thus users who wish to install it as a stand alone front end to their storage system may do so. No. Nimbus version 2.5 and higher is packaged with Cumulus and so Nimbus is intimately aware of Cumulus. Nimbus must be installed with the version of Cumulus with which it is packages. No. While Cumulus is the primary interface for transfer images in and out of the cloud, it is not the mechanism by which images are propagated from the repository to the virtual machine monitors. Propagation is done in a variety of different ways, many of which we are still developing and researching in order to find the best solution for scientific users. The reliability of Cumulus depends entirely on the storage system that is backing it. In order to achieve S3 levels of reliability you need S3 levels of hardware investment but with our system even small providers can still be S3 protocol compliant while making an independent choice on cost/reliability. In the first release of Cumulus we are only providing a posix filesystem backend storage system. However this is a very powerful plugin. It can be used against a variety of storage systems including PVFS, GFS, and HDFS (under a FUSE module). We have prototyped HDFS and BlobSeer plugins and we will be releasing them soon. LANTorrent is a file distribution protocol integrated into the Nimbus IaaS toolkit. It works as a means to multi-cast virtual machine images to many backend nodes. The protocol is optimized for propagating virtual machine images (typically large files) from a central repository across a LAN to many virtual machine monitor nodes.